This special volume of Progress in Inorganic Chemistry presents the theory and practice of molecular artificial photosynthesis-a field holding tremendous promise now that molecular solar energy materials are fast becoming competitive with their solid-state counterparts. 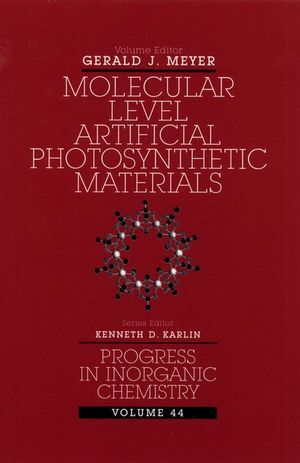 The only book on the market to address this important area of inorganic research, Molecular Level Artificial Photosynthetic Materials shows us, in effect, how to imitate the complex natural processes of photosynthesis-featuring state-of-the-art strategies and techniques for creating artificial photosynthetic devices at the molecular level. It takes a multidisciplinary approach, drawing on materials science techniques used in the design of solar energy devices, examining the molecular nature of the chemistry involved, and applying existing knowledge in inorganic photochemistry and photophysics to the growing pool of molecular photonic materials. Gerald J. Meyer is Assistant Professor of Chemistry at Johns Hopkins University. Formerly a research associate at the University of North Carolina, Chapel Hill, Professor Meyer conducts research on solar energy conversion with nanostructured materials and molecular assembly. He is coeditor of Nanostructured Materials in Electrochemistry and has published numerous journal articles. A Supramolecular Approach to Light Harvesting and Sensitization of Wide-Bandgap Semiconductors: Antenna Effects and Charge Separation (C. Bignozzi, et al.). Langmuir-Blodgett Films of Transition Metal Complexes (M DeArmond & G. Fried). Layered Metal Phosphonates as Potential Materials for the Design and Construction of Molecular Photosynthetic Systems (L. Vermeulen). Light-Induced Processes in Molecular Gel Materials (F. Castellano & G. Meyer). Charge-Transfer Processes in Zeolites: Toward Better Artificial Photosynthetic Models (P. Dutta & M. Ledney). Native and Surface Modified Semiconductor Nanoclusters (P. Kamat). Molecular and Supramolecular Surface Modification of Nanocrystalline TiO_2 Films: Charge-Seperating and Charge-Injecting Devices (T. Gerfin, et al. ).